My favorite secret weapon here is fresh, store-bought pico de gallo (always readily available in the refrigerated section of the produce area). Because while preparing your own pico de gallo (I use Shared Appetite's awesome recipe) is easy, on some busy weeknights, every single minute counts. Am I right? Also, you don't have to sacrifice the crunch of tortillas just because you're eating healthier (you know The Ninj wouldn't treat you that way): instead of piling on the calories with a tortilla bowl, just crumble a small handful of tortilla chips on top of the finished salad. And I don't know about you but most salads are extra awesome when they include a little cheese (come on ... really ... what ISN'T better with a little cheese?). Which is why I think you'll really dig the extra spiciness of the hot habanero cheddar cheese from Cabot that I included in this taco salad. Especially fitting since we just transitioned out of May's National Salad Month into June's National Dairy Month. Are you ga-ga for salads this time of year as I am? 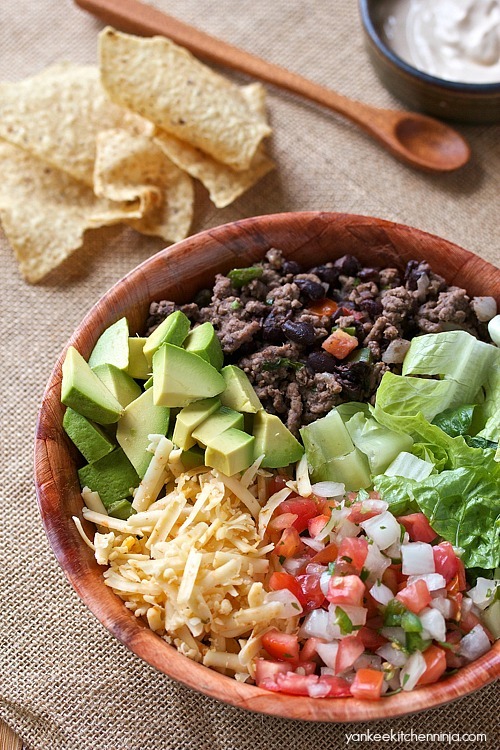 And are you lovin' the idea of this quick, easy and healthy taco salad? Leave a comment: The Ninj wants to know. In a small bowl, whisk together the yogurt and adobo sauce and set aside. Heat a large non-stick pan over medium-high heat and add the ground beef, sauteing about 5 minutes or until browned, crumbling with a spoon. Stir in 1/2 cup pico de gallo, green onion and black beans; continue to cook for another 3-5 minutes or until thoroughly heated. 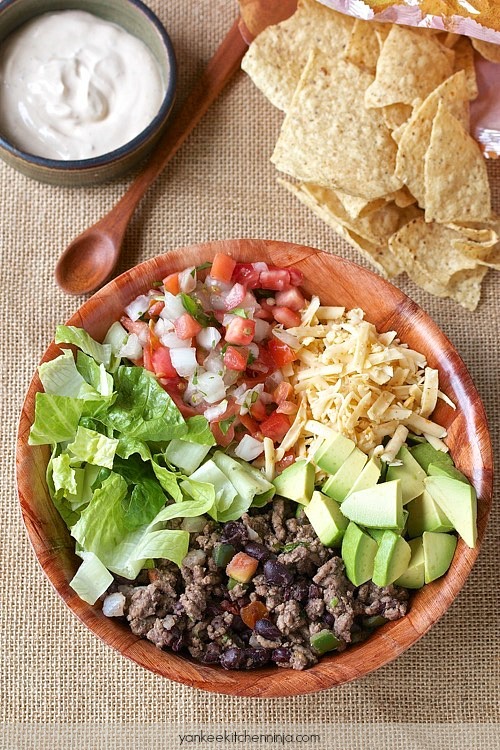 In a large bowl combine the beef mixture, remaining pico de gallo, avocado, lettuce and cheese. Add the yogurt dressing and toss gently to coat. 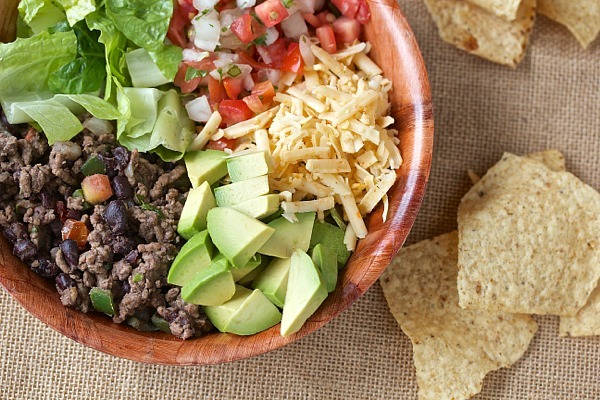 Serve each portion of salad topped with a small handful of crushed tortilla chips. This is a combo of flavors that I adore. Especially some fresh pico!